Cosy restaurant with views overlooking the fjord. Adapted for wheelchair users. Elevator. Facilities for day courses, up to 80 persons. Course and conference rooms. Accommodation capacity for 60 guests. The ideal place to hold a wedding, jubilee or private event, up to 120 persons. Innvik Fjordhotell Misjonsheimen has a green certificate. People have lived in Stryn for thousands of years. Farm names, grave finds and prehistoric artefacts bear witness of settlement here since the early Stone Age (5000 - 2000 B.C.). Stone axes have been found in Loen and Olden that actually date from around 4000 B.C. About 12,000 years ago, during the last Ice Age, the whole country was covered by a massive ice cap. In Stryn, as in other places in Western Norway, the ice has scoured, gnawed and ground its way forward to form the landscape we see today. Jagged stripes caused by the scouring can still be seen on the mountainsides. But much of the mountain fundament is solid, and that is why we still see many mountain ranges with tall peaks. The ice has also formed the fjord with its many arms and bays. Innvik (Utvik, Olden and Nordsida settlements) was a separate municipality until 1965. As a result of the Skei committee’s proposal, Innvik municipality and the Hopland farms amalgamated with "old" Stryn. The same occurred with Hornindal municipality. Hornindal broke away from the extended municipality in 1977. Faleide was the old centre for Innvik municipality. In the years before the municipality amalgamation, the seat for administration was located in Innvik. 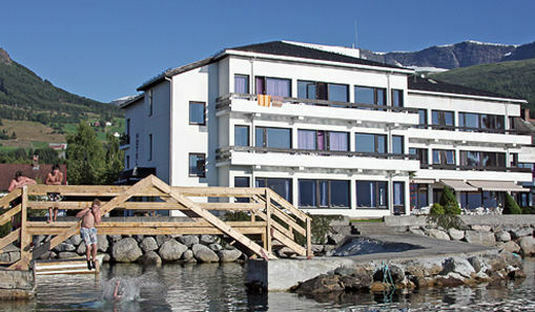 The hotel is ideally situated on the shoreline of the Nordfjord, in idyllic surroundings. Spectacular scenery. Located by regional road R60, 17 km. to Olden, 23 km. to Loen. 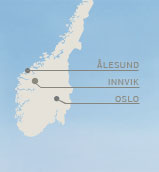 The Ekspress bus Bergen-Trondheim route corresponds with the Nordfjordekspressen bus (Nordfjord Express) (Stryn-Oslo), and stops outside the hotel.